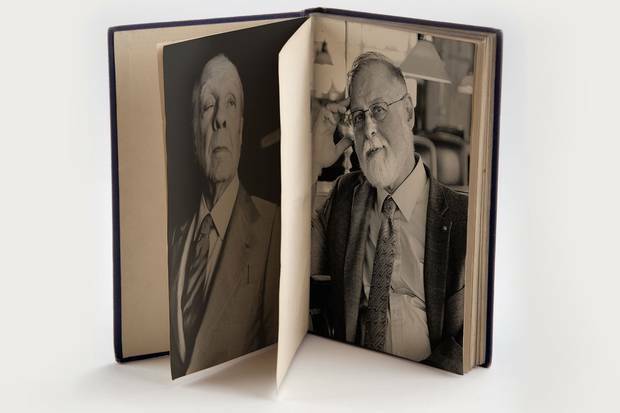 A few years after Jorge Luis Borges, left, ended his tenure as head of Argentina’s National Library, he began a friendship with Alberto Manguel, right, then a teenager in Buenos Aires. Argentina’s greatest writer was, by that time, blind, and invited the young Mr. Manguel to come home and read aloud to him, which Mr. Manguel went on to do many times over the next few years. Now, Mr. Manguel has taken Mr. Borges’s former role at the library. Alberto Manguel is harried. A stream of wealthy Argentines, all stiletto heels and elegant umbrellas, is leaving his office in the National Library; he hopes to cultivate them as donors, and ushers them to the door with awkward pleasantries. A line of employees with requests waits in the hall, hoping to catch him. An assistant brandishes a clipboard thick with demands: There is a committee, but there is also a meeting, he is expected imminently at a luncheon, and there's this journalist, and – "I've abandoned my previous persona: I detested nothing more than lunches and cocktails and meetings and groups of more than three people," Mr. Manguel says with a sigh and a valiant attempt at a smile, when he has retreated back behind the office door. "And I'm spending my life doing this." Back in December of 2015, Mr. Manguel was living in New York and teaching at Columbia and Princeton; he opened his e-mail one day to find a startling request from a stranger. The newly appointed Minister of Culture for Argentina was wondering if Mr. Manguel would consider returning to the country where he was born – and which he left 50 years ago – to serve as director of the storied National Library. Mr. Manguel says he assumed at first it was a joke – "What next, being Pope?" But when he spoke to the minister, Pablo Avelluto, and realized the invitation was real, the temptation was irresistible. "I have written on libraries and reading and books for as long as I can remember and it felt as if I were interested in cooking and had written recipes for all those years, and never had stepped into the kitchen," says Mr. Manguel, who, in his former life, was a Canadian anthologist and author best known for books about books, such as A History of Reading and The Library at Night. He had never run any library other than his own, had never been a librarian despite having first dreamed of doing the job at age 7. So Mr. Manguel finished out his teaching contracts, bade his partner, Craig Stephenson, and their life in New York a temporary farewell and headed for Buenos Aires. "I felt that I was on the last chapter of my life and suddenly there was another volume, of indeterminate length," Mr. Manguel, 69, said in a recent conversation in his spacious office, where a bust of Dante found in a flea market has pride of place on his desk. "I like challenge, I like the new … I felt that I could try to see if certain ideas that I had about libraries could work … and in the library in Argentina, which is not the same thing as a library anywhere else." Argentines ‘have to undergo a radical civic education. Radical,’ Mr. Manguel says, and he believes the library’s changes are in service of making Argentines better readers and better citizens. The decision of who should run the National Library has changed with every big shift in government – including that of neoliberal Mauricio Macri, who came to power in 2015. Your average Canadian might be hard-pressed to say who runs the national library in Ottawa, or even to say much about what the institution does, but things are different in Argentina. This national library was founded in the throes of the bloody fight for independence 207 years ago, with revolutionary goals; it has been headed by a series of great writers and thinkers, among them Jorge Luis Borges, the country's best-known author; and it is a public institution devoted to the development of ideas in profoundly polarized society. The question of who directs the library, and how, is a consuming preoccupation for the literati in this country where books, and the people who write them, are the centre of cultural life. The newly elected government that hired Mr. Manguel brought in a dramatic shift after years of leftist rule by Nestor and Cristina Kirchner. Many in cultural circles were unhappy about the new mania for privatization and shrinking the state, and wary of a government that appointed ex-CEOs to run ministries and institutions. The appointment of Mr. Manguel was cause for optimism, but also raised eyebrows in Buenos Aires: He was viewed as a sort of global and progressive intellectual, not the natural associate of the new right-wing government. There was an expectation that this new director, who had lived so long outside the country, would to try to stay away from the politics, and run as neutral an administration as he could. But to the considerable surprise of academics and writers here, Mr. Manguel has done the opposite. He has presided over a purge of staff; cancelled a slate of cultural programs; and heaped public criticism on the previous library administration, which was run by a widely respected leftist intellectual. By dint of all this, Mr. Manguel, far from being aloof, has instead mucked into Argentine partisan politics. And as he approaches the end of his first year in the director's office, he has won few friends here: He is viewed as naive at best, vain and ambitious at worst, and with little to show for himself after his first stint in the library kitchen. 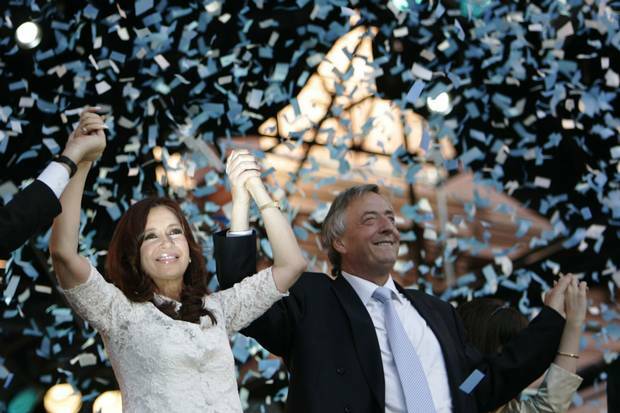 Cristina Fernandez de Kirchner, left, Argentina’s newly elected presidency, celebrates in December, 2007, outside the presidential palace in Buenos Aires with her husband, outgoing president Nestor Kirchner. Ms. Fernandez de Kirchner left the presidency in 2013. The controversy of Mr. Manguel's first 18 months at the library comes in the context of the deep schism in Argentine politics and public life. From 2003 to late 2015, the country was led by the Kirchners: first by Nestor Kirchner, who was president for one four-year term, and then by his wife Cristina Fernandez de Kirchner, who won the next two elections. The Kirchners nurtured a cult of personality that inevitably saw them compared to Juan and Eva Peron. They implemented left-wing policies focused on social inclusion, aiming to reduce the country's historic economic inequality, and on human rights (repealing the amnesty on crimes committed during the military dictatorship, for example). But as public spending swelled over 12 years of Kirchner rule, the economy faltered; Ms. Fernandez de Kirchner put heavy taxes on crucial agricultural exports, and refused to settle a debt repayment with U.S. hedge funds, shutting Argentina out of international capital markets. By the time she left office, inflation was at 40 per cent, and the peso was being sold for half its posted value on the black market. Term limits kept Ms. Fernandez de Kirchner from standing again in November, 2015, and Argentines voted for change. Mauricio Macri, the son of a wealthy businessman, was elected president, promising sweeping neoliberal reforms. But Mr. Macri only narrowly defeated his Kirchner-anointed leftist opponent, with 51.4 per cent of the vote, and the country remained evenly, and rancorously, split between supporters of a pro-statist model of development and those of a pro-market one. Nevertheless, Mr. Macri plunged into the remaking of Argentina, cutting taxes, liberalizing the peso, and ending subsidies on utilities. And of course, his government needed to name a new director for the National Library, an appointment that has changed with every big shift in government over the past few decades. Mr. Avelluto, the new culture minister who chose Mr. Manguel, says he came immediately to mind. "I have known his work for a long time, I read Una historia de la lectura when I started working in the publishing world," he said in an e-mail interview. "I knew his passion for libraries, his unlimited knowledge, his ongoing reflection on books." The minister said he was not concerned that Mr. Manguel had lived elsewhere for five decades. "I have always regarded his years outside the country as an opportunity and an advantage rather than a weakness or concern. The chance to see Argentina from outside could make it possible for the National Library not to be part of the competing intellectual and political factions in Argentina, and rather become a place where all the cultural and ideological viewpoints converge and may be expressed, as is appropriate in a republic." The intelligentsia in Buenos Aires have other theories for the qualities that recommended Mr. Manguel. "He was a bland choice, without risk," said Daniel Link, an author who directs the graduate program in Latin American literature at the National University of 3 February. And perhaps most important, Mr. Manguel said yes. "A government like this is composed of near and complete illiterates – for them, Manguel is a prize: He's read books!" said Martin Kohan, a professor of literature at the University of Buenos Aires, his light sarcasm not masking the seriousness of the opinion. "The list of those who would accept is very short – because no one in this country would think this is a politically independent position." Mr. Manguel says both that he was a political appointee, and that he somehow wasn't. "In Argentina, ever since the library was founded, the position of director of the library was seen as a political appointment, if not a political position," he said. "When I decided to accept, I accepted on condition that this would not be a political position." Legally, the library "acts independently of any political decisions and I only answer directly to the Minister of Culture on the understanding that if I get any instruction that I don't feel I can follow, I will resign." After he took the job, but before he had fully set up shop in the bulky concrete library, the controversy began: The library fired 240 employees and cancelled most cultural activities. A group of more than 100 international writers and academics, including J.M. Coetzee and Judith Butler, signed an open letter to the minister, saying the changes threatened "enormous damage" to the library's role in cultural production and guaranteeing "freedom of thought," roles it could not fulfill without those workers. "When I asked how many books we had, I was told we had between three and five million documents – that was to me an unacceptable situation for the library," he said, appalled there was no precise figure. "Scholars throughout the world complained to me that they wouldn't use the library in Buenos Aires because of the poor access to resources." Digitization, he said, was years behind the pace of other similar institutions. Unions, meanwhile, had manoeuvred to ensure that those who were fired were the people who "actually knew how to run a library" and so he had to rehire 136 of them "through the back door." Many of the employees on the rolls didn't regularly come to work, he said – with a certain glee, he tells the story of one who, an auditor found, hadn't come in for two years. When Mr. Manguel raised her name in an initial meeting with angry workers, he says another woman leapt to her defence, asking, "How is she supposed to come to work when she lives 60 kilometres away?" He said he found a specialist in Renaissance history dusting books as a cleaner, and a web of nepotism in which the former director had hired family relations including his wife and daughter. And he says the library had been turned into a meeting house for ideologues supporting the former government. The "partisan atmosphere" compounded the problem of trying to make changes, he added. He spent much of a 90-minute conversation with The Globe and Mail criticizing the previous management, and made similar complaints in an essay he wrote about his new job for the Literary Review in December, 2016. Mr. Manguel's public critiques pushed the literati in Buenos Aires from raised eyebrows to raised hackles – there is a feeling that he is contravening the etiquette of such situations (more tactful to make changes, and so, by implication, point out your predecessor's failings), and concern because the director that Mr. Manguel attacks so vehemently is respected across ideological lines. There is a strong sense that he is, willfully or otherwise, misinformed about the library and its context. Under the Kirchners, the library was run for a decade by Horacio Gonzalez, a sociologist and literary theorist. Mr. Gonzalez is the author of works such as Rhetoric and Madness: A Theory of Argentine Culture; he has a mane of iron hair, bushy eyebrows and a bushier mustache, and wears flannel shirts and jeans with the cuffs rolled. He is a member of a leftist bloc of academics that formed to support Cristina Fernandez Kirchner, but he is also critical of her government, and he is respected by many writers and academics who do not share his ideological perspective. The one person, in fact, who seems not to respect him is Mr. Manguel. But his characterization of the mess he inherited is disputed both by Mr. Gonzalez and by many others who have followed the library drama. Mr. Gonzalez says he did not hire any workers in his last months in the job, but rather that the staff grew over his 10 years there as the library added programs for "radical cultural outreach" (with a travelling railway car, for example, and a new publishing house) and in accordance with Kirchner policy on expanded public employment. In an interview in his book-lined living room in the middle-class neighbourhood of Almagro, he said that the catalogue had been kept up to date, digitization had been progressing reasonably, and that if Mr. Manguel wanted to know how many books there were, he would have been glad to tell him. "I knew." His sister, an archivist, worked at the library and retired when he did, while his daughter, an expert on engravings in antique texts, still works there, he said. But his wife never has (she is a renowned folk singer). In his time as director, he focused on connecting the library with broader Argentine political and cultural life, but "never, never abandoning the key responsibility of the library." The Globe spoke with a half-dozen professors of literature and writers, users of the library, who concurred with this assessment, saying that operations during the Gonzalez era were not noticeably deficient. And many rejected the idea that Mr. Gonzalez's cultural programming was all in the service of supporting the Kirchners. 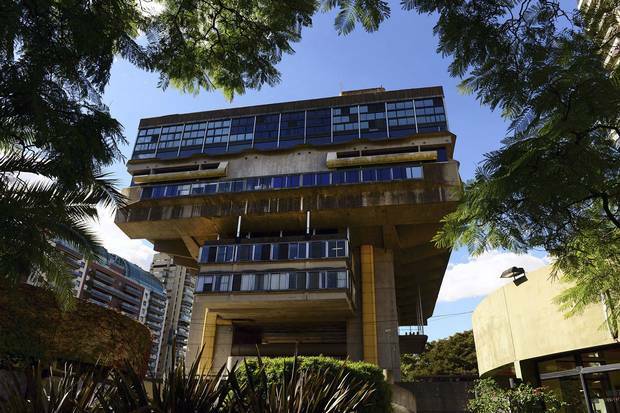 "I do not agree with Manguel that it was a national library for Kirchner supporters – I myself organized events there and I'm not a Kirchner fan," said Prof. Kohan. Beatriz Sarlo, a prominent critic of the former government, said she also spoke at and organized events at the library during the Gonzalez years, at his urging. "I was very well known as anti-Kirchnerist and my initiatives were received and carried out," she said. "So it is a plain lie to state that there was an ideological filter." Maria Pia Lopez, who was director of the Museum of Books and Language – a part of the library which Mr. Manguel is "revamping" – and who has since returned to an academic career, said he seems not to understand that hard-left organizations met there, but that right-wing ones did too, and that the point was to try to make the library open to the public. "He prefers a library that is for readers and researchers," she said. "But the action of reading has changed: There are more remote readers now, and no one will physically go to a library to read any more, so you need to draw them. You need to build a digital library to reach remote readers, but you also need to do cultural events to make the space alive." Prof. Kohan said the strident critiques of Gonzalez supporters, who claim the library is now barren and empty, are untrue. "But the literary prestige that Manguel encourages often shuts people out – it intimidates people," he said. "It is true that the role and space occupied by the National Library in the cultural life of the country has been reduced." Mr. Manguel contends that he replaced the old activities with a new, and much richer, range of events that made the library truly open to all Argentines – one of what he says are many achievements in his first year. Wearing a tweedy greenish blazer and clumpy black brogues with bright red laces (the antithesis of the sleek suits most men sport in the upscale Recoleta neighbourhood where the library sits in a patch of park), he bustled down its hallways on a rainy autumn April morning. In addition to updating the library catalogue and speeding the process of digitization, he said, he recently implemented a time-card system, so that he can track employees who don't come to work, and further winnow the size of the staff. He is setting up a Museum of Comic Books, housed in its own annex; one for detective novels; and another for the history of psychoanalysis in Argentina (Buenos Aires has both the highest number of bookstores per capita, and of analysts.) He has dispatched photographers to capture the graffiti around the city, photos of which will be archived, and started a Department of Ephemera that will hold things such as political pamphlets. The project that seems to excite him most is a new Centre for Indigenous Studies. "In Australia or Canada, the natives are 100 times more organized politically than in Argentina, where they are completely, completely neglected," he said. "That is a place the library can say, 'Hold on a minute, these people are alive and well and they have this culture and this is what they have to say, and this is a place for them to say it.'" The library collection includes documents in the languages of many of Argentina's First Nations, he said. Many of these are ideas inspired by Mr. Manguel's ties to Canada (Argentina, he says, is his country by an accident of birth, but Canada was a "love marriage") and they are of a different nature, a different sort of cultural engagement, than the lectures and debates and homages to authors that the library staged in the past. The ministry says that Mr. Manguel's efforts are turning around an ailing library – some 217,150 people visited in his first year as director, compared to 194,250 the year before, according to ministry figures – despite the fact that the budget has been reduced by more than a third since he took over (down to $26-million). All of it, Mr. Manguel says, is in the service of making Argentines better readers, and better citizens. "I believe that there are possibilities in Argentina because we are essentially an intelligent, hard-working, curious people and the country is unbelievably rich in natural resources – but we have to undergo a radical civic education. Radical." He wants to set up a centre for young readers, and an outreach program for teachers, who, he said, need to be taught to value reading. "Through the teachers, we can access sectors of the population that are not inclined to read, that are told they are too stupid to read, that are given fodder so that they don't begin to question the government or the law. And I think that the library can do that – I've always believed that that is the ultimate function of reading." Argentine media crackles with criticism across the political spectrum, but Mr. Manguel characterizes the country he has returned to as one near-devoid of intelligent public debate. "The political discussions in Argentina are between soccer hooligans, and the dialogue is, ' Muere este, Vive este! Vive este, Muere este! ' We don't even have words in English to say that. There is no engagement possible with 'Long live so-and-so' or 'Down with-so-and-so' and so it's very easy to stay out of the government." Such declarations puzzle many in the literary community who are watching his tenure unfold. "I think he just doesn't know Argentina and its intellectual life," said Prof. Lopez. "And the interlocutors he has here see everything [through a partisan lens]." He has adopted many of the favourite tropes of the Macri ministers, she added, such as the assertion that the state was bloated with employees who never went to work, perhaps without even being aware of how he sounds to Argentines. The writer Daniel Link said Mr. Manguel's ambition to take partisan politics out of the library was an admirable one, but the institution still requires cultural politics, and he must know the place if he is to build that foundation. "Those politics need a grounding: a diagnosis of what the actual culture needs. Otherwise [the library] is just a literary café." Mr. Gonzalez, the previous director, mostly maintains an arch civility about Mr. Manguel and his many criticisms. There is nothing inherently problematic with the idea of a person who has come from away running the library (it once had a brilliant director from France), he says, but that person must be clear-eyed about the country he has come to. "He's more involved in Argentine politics than I am, without knowing it," Mr. Gonzalez said of the new director. 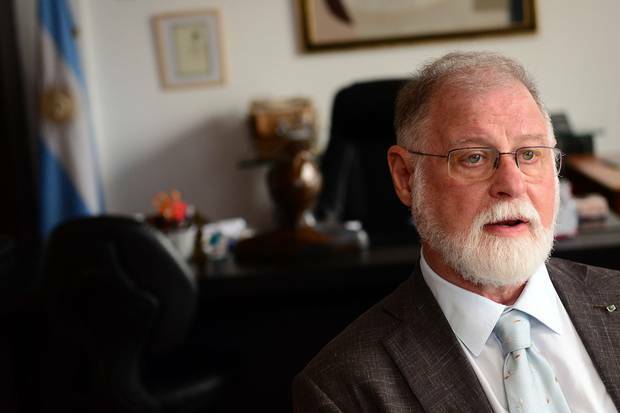 "I don't want to fight with Manguel … I do not want to say what I am going to say, but he forces me to do it: He doesn't know Argentina, he doesn't know the country … he is naively in the hands of the right of Argentina, he is not a person from the right, but he is culturally clumsy, in spite of all his reading of Dante." As a progressive Canadian, with a global word view, Mr. Manguel must, privately, be finding his job difficult, his predecessor speculates. "He is linked to a government that has no respect for human rights, and I suppose that he must be intimately disturbed … This government has a policy [… that] revindicates repression." (The Macri government has been widely criticized for moves to end prosecution of dictatorship-era crimes, a plan that is popular chiefly with the ultraright who are connected with those abuses). 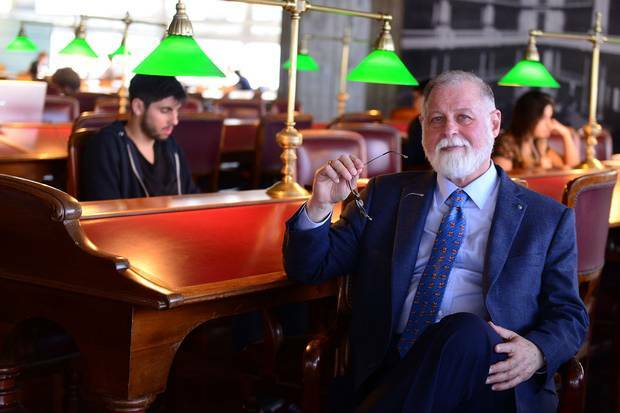 In a conversation in a bookish Buenos Aires café, Martin Kohan, too, said he found it odd that Mr. Manguel would associate himself with, and stake his reputation on, a conservative political project. But then, after a moment's reflection, he added that the reason is obvious: Borges. When Mr. Manguel was a teenager in this book-mad city, he had an afterschool job in a bookstore called Pygmalion – and there, according to a story he has told and retold, he happened to meet Jorge Luis Borges one afternoon. The great writer was, by that time, blind, and invited the young Mr. Manguel to come home and read aloud to him, which he went on to do many times over the next few years. Mr. Manguel has made much, in his career, of his admiration for the great Argentine writer and of this association. He mentions the relationship in much of his work, and in fact, wrote an entire book about it, called With Borges. Outside Argentina, he is seen as a confidant of and authority on Mr. Borges. In Buenos Aires, people see it a bit differently. "It's well known that Borges stopped every person who walked by and made them sit and read to him," said Prof. Lopez. Mr. Borges himself wrote once that "the whole city was my reader." Most writers here view this overstating of the relationship with a sort of amused charity. But Mr. Borges, who ran the National Library from 1955 to 1973, is the most famous director the institution ever had – and the dominant theory in Argentina today is that the chance to tie his "brand" to Mr. Borges by occupying his former desk was so alluring that it drove Mr. Manguel to take up the library job, and whatever political obligations that came with it. Prof. Kohan summarizes it this way: "It was a mutually beneficial transaction: The government needed a prestigious person, and for Manguel, it is the closest to Borges he could be after being in his house reading." "I think I understand why he accepted: He was excited to come here, he has this enthusiasm for Borges," said Prof. Lopez. "What I don't understand is why he stays." Asked if his agreement to take the job amounted to a de facto endorsement of the Macri government, Mr. Manguel replied, "When I accepted, it was seen as if I were embracing the new government's policies and I made no statement as to my allegiance or criticism of the government's policies, very deliberately," he says. But isn't silence seen as de facto agreement? "Of course." And is he lending his prestige to the Macri administration? "Of course." He gave a weary sigh. "Anything that you do in Argentina can be seen with that connotation, and part of the fight is to repeat constantly: I'm the administrator of an independent institution that is at the service of the people of this country and I respond only to the people of this country." With that, he returned to the list that awaited him: purchase orders, fresh leaks from the rain, that luncheon. And one larger task: to change the role of a 200-year-old institution, or, if he can't, to survive the ways it changes him. Stephanie Nolen is The Globe and Mail's Latin America correspondent. Review: Alberto Manguel’s Curiosity explores our relationship with the written word Curiosity isn’t Alberto Manguel’s end, or even his target. It’s his passport, his invitation to travel, Ian Reid writes. Review: Brazillionaires offers a brilliant analysis of a nation’s ultrarich With its accessible, in-depth look at class in Latin America’s largest country, Brazillionaires by Alex Cuadros is a vital book with few companions, Stephanie Nolen writes. Review: The Dream of My Return is a work of deliberate contradiction inspired by exile Salvadoran author Horacio Castellanos Moya avoids accepted narratives in thrilling ways, Pasha Malla writes.